Convenient and pleasant when traveling to Baku to be equipped by own means of move in rent. This service you can order arrived already in place or in advance, online on Naniko.com, using the booking form. Rental cars in Baku – Thousands of tourists and business people are choosing our services, due to efficiency and favorable conditions. So why do not you follow their example! 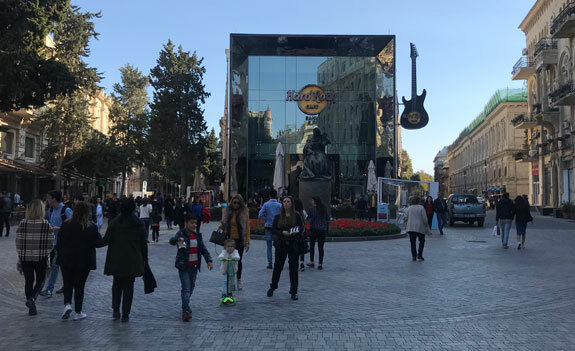 Remember that it is always easier and more guaranteed to order previously, peculiarly during the spring and summer months, which are the most lively in Baku. Car hire in Baku at affordable prices and easy reservation system with Naniko! In the presence of our own fleet, we are able to offer a huge variety of vehicles. You can choose your auto according to different criteria: petrol or diesel, with manual or automatic transmission, ranging from small runabouts and volume up and roomy minivan with a capacity of 9 to 15 seats. All vehicles are modern versions, equipped with air conditioning. For family fun, a great idea to take the category of sedan or SUV convenient for travel over rough terrain. Typically, these cars have a large baggage compartment, which is very convenient to transport your belongings. And if necessary, you can always order a luggage cart, ski rack, navigation, child seats or other devices. The capital of Azerbaijan every day attracts more and more visitors, correspondingly to the exceptional improvements that turned it into one of the most lovely and modern places in the world, as well as the appeal of the old part of the city and its proximity to the Western world. Rent a car in Baku – Baku offers to visitors a huge variety of wonderful attractions, including the amazing Red Lake, the Salt Lake Zabrat or raised reserve Gobustan Qoruğu. Maiden’s Tower is disposed in the old part of Baku and from 2000 is included in the UNESCO World Heritage List. The origins of this structure lies in the fourth century, at the base of which is laid a huge stone, leaning towards the sea, and then fortified and decorated several times and was used as a Zoroastrian temple. From the second floor overlooking the amazing hole, which was intended to collect rainwater. The famous Palace of the Shirvan Shahs, perhaps, is the most famous monument of Azerbaijan and it dates back of the fifteenth century, when Ibrahim I moved the capital from Shemakha in Baku. This monumental complex consists of a main building with a central portal, a stone pavilion containing inscriptions in Kufic script, Mosque, built by Sultan Kalilullah I, with a domed mausoleum of Shirvanshakhs and other interesting buildings. In 1964, the palace was converted into a museum, and has experienced a long and substantial restoration, returning it to its former glory!